We had heard wonderful things about the northern Lao town of Luang Prabang. Della’s sister Dana had visited here a few years back and she said it was one of her favorite places! We were quite excited to experience this UNESCO World Heritage-designated town for ourselves. It was pretty straight forward, but definitely not a pleasant bus trip! Once we arrived, we decided to walk the 1 to 2 km into town to our guesthouse. 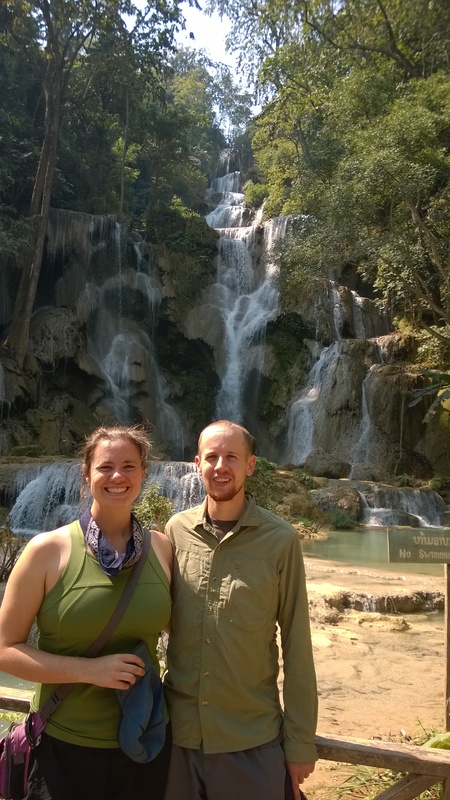 We ended up staying a two different places in Luang Prabang. We were excited because we were planning to meet Della’s parents (again), but we would arrive one day before they did. We booked a place called Liberty Guesthouse online, but when we arrived there, the owner was waiting for us to let us know that there had been a computer error of some sort (we never quite understood) and that there was no room at his place. But, he had booked us a room at his cousin’s hostel called Central Backpackers for the same price. He took us there and we smoothly transitioned to our new guesthouse. Our room was OK, but it felt like a slightly rundown, very backpackery, kind of place. We enjoyed the included breakfast though! The second day we moved to a much nicer (pricier) place that had been booked by Della’s parents called the Manichan Guesthouse. We stayed there the remaining nights in Luang Prabang. It was a lovely guesthouse with a very good included breakfast. It was also a bit more centrally located in old town Luang Prabang. Walked Around Old Town Luang Prabang and River Fronts – The UNESCO listed old town is the closest thing we’ve experienced in Asia to some of the lovely old towns in Europe. We very much enjoyed strolling the streets of this quaint and laid back town. We spent many an afternoon and evening just walking. Luang Prabang is situated on a small finger of land sticking out at the confluence of two rivers. Eric and Della spent the day before Della’s parents (Wayne and Peggy) arrived just exploring, enjoying the sights over both the Mekong and Nam Khun waterfronts. 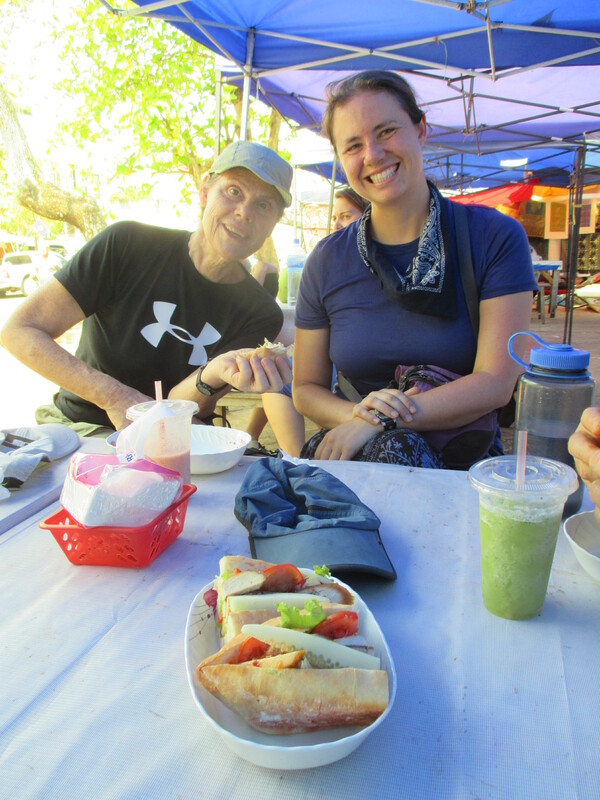 The following day, we did a similar walk with Wayne and Peggy and we headed over to the Nam Khun side and saw a cute bamboo bridge and decided to cross it (5,000 kip – $0.60 – toll per person). There wasn’t too much to see on the other side, but it felt like a more “real” part of town, so we walked a little bit but then decided to turn around and cross back over, then walked down the riverfront to the confluence. We sat and enjoyed the view. We then walked back down the Mekong riverfront, pausing to enjoy some young coconuts on the way. Still another day, we walked down to the confluence again and Peggy decided to soak her feet where the two rivers met before we walked down the beach-side of the Mekong. Another thing we enjoyed while walking was the amazing markets. There is a local morning market full of colorful, unique foods. We saw live fish, bare chickens, fried crickets, roasted rat, and more! In addition, there is a night market more geared to tourists. Both were quite pleasant to meander through. Hiked Up Phu Si – Our first morning with Wayne and Peggy, we headed out for a hike up Phu Si, the hill in the center of town. The walk up was 358 stairs according to the guidebook. At the top is a bright gold stupa and a small wat. We enjoyed the 360-degree views even though the day was a little hazy. We took the eastern route down and ended up in a monastery where we saw a small cave with some statues and a large natural Buddha footprint. The first building we encountered was a fancy white temple housing the famous Pha Bang Buddha image which gives the town of Luang Prabang its name. We were able to get a glimpse of the image which is reportedly from the 1st century. We then took a tour of the palace itself (after removing shoes and checking bags). This including reception rooms, the throne room, and then bedrooms. The reception rooms and especially the throne room were decorated in the lavish style you would expect, but the bedrooms were surprisingly sparse. The only other main exhibit was behind the palace – the royal car exhibit. This contained some of their old Lincoln Continentals for ferrying the royalty and their guests around. Visit the TAEC Ethnographic Museum – We enjoyed our short visit to TAEC, a tiny ethnographic museum focusing on the smaller ethnic groups in Laos. It had small but interesting exhibits on four different groups: Akha, (H)mong, Khmu and Tai, describing their traditional dress and crafts such as weaving. There was a separate room with exhibits on all of the hard work that women in these cultures have to do: child rearing plus healing and crafts, etc. Observed the Alms Giving to the Monks – We woke up before dawn one morning so that we could catch the “tak bat,” the daily ceremony where monks go through the streets of town and receive food as an offering. We weren’t sure what to expect because we had heard that the scene could get quite touristy. Lonely Planet warns that sometimes the tourists actually outnumber the participants and despite signs and warnings everywhere, the tourists can’t seem to be completely respectful of the ceremony. Generally, tourists are asked to stay across the road from the procession and not to thrust cameras in the faces of the monks. We had experienced this a bit in Myanmar, and were not anxious to be part of the tourist throng. The owner of our guesthouse gave Wayne and Peggy some general tips of where we could go to observe without being in main tourist area, so we first headed down by the river. Only a couple of people were there so we walked on to see if we could see anything else. Outside one monastery we saw a group of about 15 monks emerge. A few townspeople and also a few tourists knelt and gave them sticky rice to put in their baskets. Some people took inappropriate pictures but it wasn’t too bad. It was over so fast that we felt a little underwhelmed. Because we hadn’t seen much of anything, we headed back toward the main street of town where we expected both the main groups of monks (and tourists) to be, but we never really found it. We saw just a few more groups of monks, but never found the large collection that we had been envisioning. Visiting Wats – We spent one day exploring the multitude of beautiful wats (Buddhist temples) in town. Our main target was the big one, Wat Xieng Thong. We walked down the main street and stopped at a few others on the way first. Wat Sensoukaram had a nice red temple that made for good pictures. Wat Souvannakhilli had a small free exhibit about meditation in its main building. Wat Xieng Thong was the only one that required admission, but it was pretty impressive. It is most known for being one of only two temples that was spared when the city was invaded by a Chinese tribe. The main building, built in 1560, was beautiful, with expansive gold murals inside. There were also a few buildings covered in glass mosaic similar to the throne room at the Royal palace. Another large building housed a big carriage used in processions and some other artifacts. 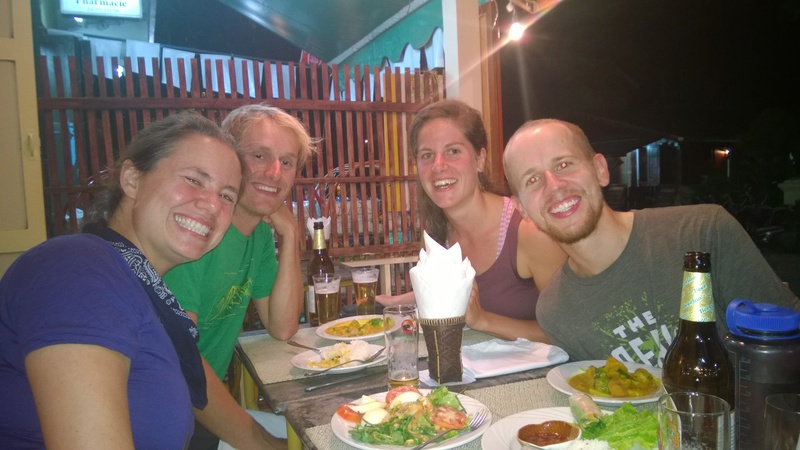 We had quite a few memorable meals in Luang Prabang. Our first evening, we had arrived pretty late and were quite hungry. We just wanted something quick so we headed to the main part of town where Eric had read that there was a market. There was a huge market, but we didn’t see a lot of food until we got to the food street! This was a narrow alley-like road that was packed with food stalls. There was meats of all kinds being barbecued, spring rolls, crepes, and lots of soups. But we ended up eating from a buffet like table. For about $2 (15,000 kip) you could fill a bowl with as much as you wanted. Then you gave it to the stall owner and she fried it for you in a big wok, making sure it was nice and warm (and hopefully all the germs killed). It was delicious! We ate two nice meals on the banks of the Mekong River. For one lunch, we were looking for something quick, easy, and cheap. We saw a food stall with some nice tables overlooking the river with good prices. We were a little disappointed in the quickness aspect, but the taste was nice! The second meal was with Peggy and Wayne. We headed to the riverfront at sunset and enjoyed a lovely view while we ate! Our guesthouse had some good eats as well. 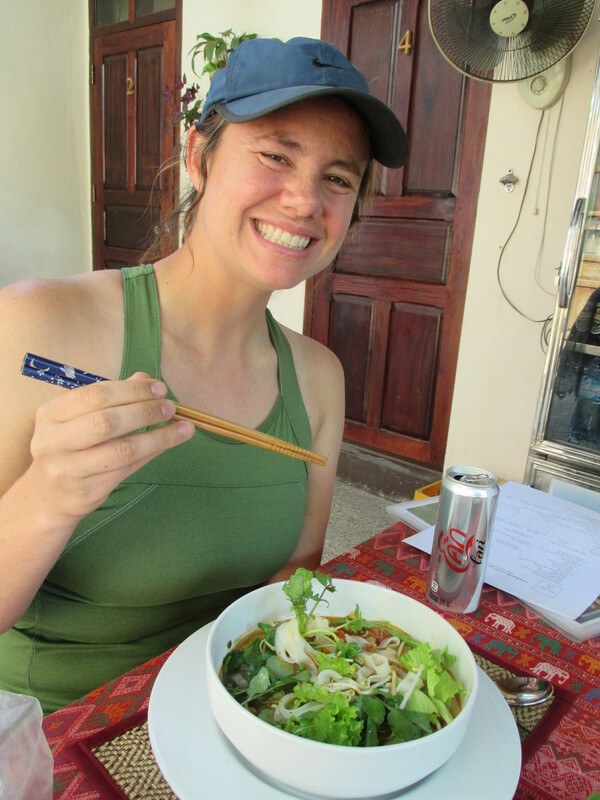 One afternoon we all got a special Lao soup called Khao Soi from the guesthouse. Some of the most exciting meals were actually when we got to renew a connection from the past! Remember the Belgian bikers we originally met in Albania, and then met again in Greece?? Well, lucky for us, our paths crossed once more in Luang Prabang. We met them for two evening meals. The first was at Café Toui which is known for its Lao set menu. Unfortunately, when we arrived they said we couldn’t have that. =/ However, we had some other Luang Prabang specialties including a Luang Prabang special sausage and pumpkin curry. The food was good and company was great! We met them for a second evening where we again visited the food street at the market, and it was delicious a second time around! Another Lao favorite is a sandwich! This comes as a legacy of the French and there are many stalls that will serve you up a nice baguette with a variety of fillings. We enjoyed one such lunch. On our first evening with Peggy and Wayne, we headed to Khaiphaen Restaurant, which Eric had seen as highly recommended on TripAdvisor, both for the local style food and for its mission, which is to be a training restaurant for disadvantaged youth. The servers, students supervised by a teacher, were definitely very eager to help. We got an appetizer of khaiphaen (fried river weed) to share, then for dinner Eric got Mekong fish and prawn laksa, Wayne got orlap (a local soup with pork, eggplant and mushrooms) and Peggy and Della both got larb. The flavors on the soups were good but more subtle than we were expecting. Eric’s soup had woodchips in it! We enjoyed the laid-back atmosphere and the chance to experience a nice old town. For some reason, we didn’t completely fall in love though. We think this might have to do with expectations as so many people had sung praises of this place. It was really nice, but when you expect to love something, somehow it sets a really high bar that is hard to meet. In any case, Luang Prabang is a lovely place and we did enjoy our time there. It was also nice to see Della’s parents again and to meet up with new friends halfway across the globe!